Increased suspension performance, stability and travel. Remove the short, stock stud type shock mounts that limit the suspension travel and replace them with our tubular dual mounts. 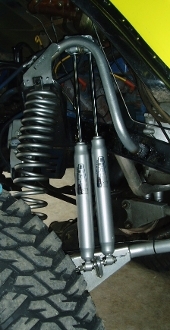 Dual shocks allow the shocks to run cooler, work half as hard as a single shock, provide increased stability in off camber situations and while cornering; a must have option for trail or street vehicles. Some inner fenderwell trimming required on fullsize models. Welding, cutting and drilling required. FULLSIZE NOTE: On some models of 78/79 Fords with A/C, trimming into the plastic A/C box slightly may be necessary especially if the stock body mounts are in poor condition. If you desire to have zero trimming please contact us for a zero trim set of hoops which are shorter in overall height but also shorten the available shock travel (these are also good for very tall 12" plus lifted trucks). This is a build to order item. Please allow 2-4 weeks for us to build and to ship them.